The Jefferson Educational Society's 4th annual Global Summit brings some out-of-this-world speakers to Erie over the coming days. On Thursday, Nov. 15, at approximately 7:30 in the evening, the universe, as you know it, will be turned upside-down. Ancient secrets will be revealed. A dark, mysterious force lurking on the periphery of human knowledge and working to pull asunder the very fabric of existence will make itself known. A science fiction movie? A carnival sideshow? Hardly. Instead, it's the topic of Harvard professor and astronomer Dr. Robert Kirshner's talk — "The Runaway Universe: Einstein's Blunder Undone" — at this year's Global Futures Summit hosted by the Jefferson Educational Society. So, what does Kirshner have to do with cataclysmic change? He was the faculty adviser to 2011 Nobel Laureates Brian Schmidt and Adam Riess, and contributed to their research that determined that the universe was not, in fact, contracting or slowing its expansion as previously believed. Instead, the universe is expanding, and that expansion is accelerating. On the phone from his car heading out of Boston to Maine, Kirshner explains. "Your commonsense observations are from Earth," he says of our mistake of applying our common understanding of physics to the universe. "[Accelerating expansion] would be like a baseball that was hit and kept going up, faster and faster." It's ridiculous, of course. Common sense tells us the force of gravity from the combined matter of all the universe would slow and eventually check the expansion of the universe, even contract it, akin to the way the water thrown up by your brother-in-law's cannonball dive in the pool eventually falls back to the surface. But the expansion of the universe is instead accelerating, which tells us one of two things: there's a force "pulling" the universe, or everything we think we know about gravity is wrong. The discovery blew a universe-sized hole into the study of astrophysics, the nature of matter, existence, being. "It's so much fun for us!" gushes Kirshner on the phone. "These ideas are very interesting! That the expansion of the universe is actually speeding up — we wanted to measure how much it was slowing down, instead we discovered that it's actually speeding up!" He laughs. The joke was on him, on all of us, ha ha! Kirshner is warm and personable, and obviously thrilled to be explaining astrophysics to me. He's like a kid who turned over a rock and wants to show you the cool bugs he discovered. And why not? It is amazing! I am thrilled! On one side is gravity, as all universal matter pulls itself together. "On the other side," says Kirshner, "is this dark energy, this force that makes the universe swell. As far as we know, the only way we have of detecting dark energy is through astronomical observation." And observation is how the Nobel teams discovered the acceleration. By observing the light of supernovae billions of light years away, astronomers were able to measure the brightness of the exploding stars to determine their distance. "One of the things Adam Riess" — now a professor at Johns Hopkins University — "did when he was a graduate student with me," says Kirshner, "he worked on a way you can detect dust." Clouds of intergalactic dust sometimes obstruct the supernovae, affecting the brightness of the distant stellar explosions. But the dust wasn't readily detectable. Kirshner explains how Riess solved the problem: "The dust absorbs blue light more than red light, and measuring that light, you can figure out how much dust is in the line of sight." Using Riess' method of detecting dust, the teams of astronomers were able to measure more accurately the brightness of supernovae. "I would say it's still a problem," says Kirshner, who wants more accuracy in the observations. "I have a program now" — Kirshner is the principle investigator of a Hubble Space Telescope program — "to measure some supernovae in longer wavelengths, like infrared." The goal? To pinpoint the "cosmological constant," the force that serves as an anti-gravity effect and first was conceived by Albert Einstein to account for what was then thought: a stationary universe. When observation showed the universe is actually expanding, Einstein thought the effect a mistake. But now with evidence of an accelerating universe, the cosmological constant has been revived. This stuff makes rocket science look like child's play, yet here's a Harvard professor explaining it all to me while threading through highway traffic. "People are interested in questions of where we came from," he explains, "where we are in space and time, and where we're going." And Kirshner likes answering these questions for laypeople — people like me. His book, The Extravagant Universe, tells the story of the discovery of the universe's acceleration in "layman's terms with little math," writes one reviewer, and in a "lively, accessible style," according to The New York Times. "Scientists talk to each other, and the language is remote," he says. "There is a kind of need for translation or communication from the world of science to the broader world. "My plan is to use language people do understand." He laughs. "I do have a few graphs to show I'm a serious guy, though." The Global Summit — a week-long series of lectures hosted by the Jefferson Educational Society featuring well-known and expert speakers on topics positing what the future will bring — has become for Erie a must-see showcase of ideas that could possibly affect the course of our regional development. Started just three years ago as an ambitious yet modest series featuring Washington Post columnist EJ Dionne, the Summit is growing exponentially, and promises to become the intellectual event of the Erie area. That first Global Summit was attended by less than 500 people; this fourth Summit is expected to draw over 3,000. Besides Harvard astronomer Robert Kirshner, the Summit this year features New York Times columnist David Brooks and former White House Deputy Chief of Staff and architect of the modern Republican Party, Karl Rove. Other speakers include the Rev. Barry Lynn of Americans United for Separation of Church and State, Norman Ornstein of the American Enterprise Institute, and Ira Byock, director of palliative medicine at Dartmouth-Hitchock Medical center. But the Summit is just one week in the program of the Jefferson Educational Society — maybe the one with the biggest names, yes — but the rest of the year also features classes, seminars, and lectures by historians, experts, and personalities. The Jefferson Educational Society is a think tank. That is, it's a not-for-profit organization that funds research and promotes awareness about different kinds of public issues and policy. On its website, JES's mission statement says the JES was founded "to promote civic enlightenment, and community progress for the Erie region." If you want to hear analysis of the Republican and Democratic National Conventions, or discuss the origins of civil war in Syria and Jefferson Davis' role in the Civil War, or listen to Pat Cappabianca give an insider's view of Erie politics, or, yes, have the inner workings of the universe revealed to you, the Jefferson Educational Society is the place to be. It's raining when I arrive for my morning meeting with Jefferson Educational Society executive director, Ferki Ferati, and I hurry into the organization's offices, past the banner with a Thomas Jefferson bust advertising the Global Summit, to get out of the wet. The JES is housed in the Brith Shalom Jewish Center — or, more accurately, the organization takes up most of the sandstone building, leaving the congregation to occupy a wing — and the anteroom with its coat rack, whitewashed concrete block walls, and heavy waterproof carpet has the familiar feel of entryways of churches and synagogues everywhere: a good, spacious area to wipe your feet, greet your rabbi, and gossip with the neighbors. The coffee machine is in an adjacent windowless room where Administrative Assistant Arin Donelson works, and against one wall is a stack of yard signs for Republican state house candidate Jason Owen, a remnant from the Erie-Reader-organized political debates that took place here a few days earlier. Ferati ushers me down a short hall and up some steps into his office, a spacious and well-lit room with walls painted yellow. On the wall directly behind his desk is a portrait of Abraham Lincoln; on another wall are a series of landscapes. He guides me to a leather couch and takes a seat in a straight-backed chair across a coffee table opposite me, crossing his legs and clasping his hands. Ferati is a young man with dark, slightly unruly hair, with sleepy eyes, and a boxer's nose. "What we're in charge of," he says in a slight East European accent about the role of the JES, "what we're supposed to do is bring in new ideas and shine light on the issues." He cites a study on how slowly ideas reach Erie compared to New Haven, the seat of Yale University. "Erie gets ideas eight to 10 years behind New Haven," says Ferati. "New ideas tend to move slowly into Erie. Our job is to expedite that process. Our job is to enlighten people. "Somebody said this is a feed-your-mind kind of place." And, in a sense, the JES does offer up a kind of buffet to the public. That same afternoon, for example, historian Donald Hickey, a professor at Wayne State University, gave a luncheon lecture entitled "Ten Things You Should Know about the War of 1812 (But Probably Don't)" to an audience of around 100. Hickey's talk was one of several that week and part of the Perry 200 events commemorating the War of 1812 and Erie's involvement in it. Modeled after the Brookings Institute and the 92nd Street Y, the JES does more than host lectures. This year, for example, the think tank led a three-day excursion to tour Thomas Jefferson's home and architectural masterpiece, Monticello, as well as Washington, D.C.
And sometimes, ideas generated by the JES result in concrete ways. After sponsoring a lecture on how Austin, Texas, built itself into one of the nation's greatest cities, members of the think tank were inspired to create a regional plan for the Erie area. Organizing disparate civic leaders — from the chamber of commerce, city and county governments, for example — the JES helped acquire a federal grant to write a regional plan. The Perry 200 — that series of commemorative events for the 200th anniversary of the Battle of Lake Erie — was also a JES brainchild. The organization spearheaded its birth and raised the money to fund it. "We looked around the community," explains Ferati, "and nothing was being done to celebrate Erie's number one historical role in the national stage. The Battle of Lake Erie is where we were born, where we became a city. We saw that nobody's doing the celebration. Again we wanted to plug that hole. We wanted to keep the city energized." In short, Ferati envisions the JES as the intellectual catalyst in revitalizing the city and region. "That's what we want, five to ten-thousand people interested in progressive ideas," he says. "Five to ten-thousand people. We could combine wills and go out there and make real change in the community, that the community would gather and do something good for itself." Ferati was born in Kosovo, one of six children of an ethnic Albanian miner and farmer. His family was caught up in the strife and war that tore through the Balkans; when Kosovo declared itself independent from Serb-dominated Yugoslavia, the Kosovo War started, pitting mostly Muslim Kosovo Albanians against Serbs in a brutal conflict highlighted by mass graves, ethnic cleansing, and civil war. More than a million Kosovars were displaced by the war, including Ferati's family, who had fled to a refugee camp in Macedonia. From there, they were sponsored to immigrate to the United States. That's when Ferati came to Erie. Here, he went to Mercyhurst Preparatory School and Mercyhurst University, enrolling in university's research analysis program — now the Mercyhurst Institute for Intelligence Studies — and found a research internship with Dr. William Garvey, who was putting together the JES with some other local leaders. They needed a director of research. Ferati got the job. And when they needed an executive director — heck, Ferati was already doing all the work the director would do, so they hired him. "Erie gave me pretty much everything I have," says Ferati. "I got an education. Now I have a chance to give back to the community, which made me who I am. "Is Erie perfect? No, but that's what I'm here to do, and I want to contribute towards a better more stable community." It's an old story: the immigrant makes good in the United States, but Ferati has put a twist in it by becoming the head of a think tank — something that Ferati himself pointed out could never happen any place else. And here, in mid-November, in the Global Summit, is the culmination of the Jefferson Educational Society's contribution to the community, a gift from a man chased halfway across the globe who found first a refuge, and then a home, in Erie. "I'm not one of those Erieites that leaves and neither comes back nor cares," says Barry Casselman. He tics off his Erie credentials, where he lived (on West 10th Street), where he went to high school (McDowell), that his father was the longest-serving physician at UPMC Hamot (65 years!). He talks about Erie's history, the War of 1812, its mid-18th-century role as a railroad center, its production of nuts and bolts in the early 20th century and war materials for the Second World War. He talks about the city's historical museums, the vineyards in Northeast, the sweet corn and other agricultural products of the region. He mentions Tom Ridge — the Erie-raised former governor of Pennsylvania and the first Secretary of Homeland Security — putting the city on the political map. "My family is deeply ingrained in Erie," he says. "For me, it's a big deal. I'm really honored." The honor being bestowed on Casselman is the second Thomas B. Hagan Dignitas Award, given by the Jefferson Educational Society to an Erie citizen who has made a significant contribution to the "vitality of American democracy." And as part of the honor, Casselman will be speaking in the Global Summit, on Friday, Nov. 16, at 7:30 pm. Casselman is a writer. Earning his M.F.A. at the Iowa Writers' Workshop, he writes poetry, plays, and fiction, but politics and journalism are his bread and butter, and he's written for publications like The Weekly Standard, Politico, RealClearPolitics.com, and Roll Call, as well as a variety of newspapers. He's appeared as a regular political analyst for a number of radio stations, appeared as a lecturer, and write two books on Minnesota politics, the state where he currently resides and where he's known as "the Prairie Editor," and writes regularly on his blog at barrycasselman.blogspot.com. Casselman's "specialty," if you will, is the analysis of presidential politics, having written about presidential primaries and polling since 1976 and has attended each national convention since 1988. His most recent book — "Taking Turns: Political Stalemate or a New Direction in the Race for 2012" — covers the early rounds of the 2012 presidential race to the run-up of the conventions. Casselman's Global Summit talk, "The Votes are In: What's Next For American Politics?" then, is little surprise given the fact that it'll occur just days after the election on November 6. In it, Casselman will provide analysis of the election, and what's likely to come of it. "You can count on me being very outspoken," he says. And Casselman is thrilled to be addressing the Erie audience. "Active, helping think tanks are very valuable to the intellectual world of a community," he says. "They nurture a community." That's a sentiment shared by the recipient of the first Thomas B. Hagan Dignitas Award, Steve Scully, who spoke at last year's Global Summit, and is an executive producer at C-Span, managing its political content. Scully returned in 2012 to chair the fourth Global Summit. "In any community, the richness of that community is based on arts, culture, history, research," he says, rapid-fire, from a cell phone on a train bound for New York. 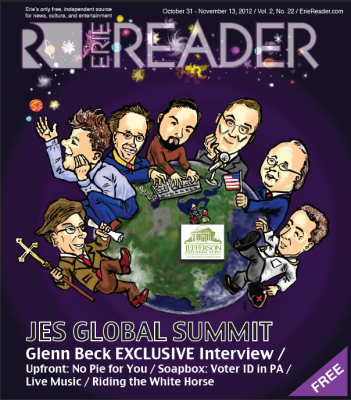 "What the JES does well is bring leaders, journalists, opinion-makers to an audience that is receptive." Scully's an Erie native, too. One of 16 (!) kids, he grew up on the west side and attended Strong Vincent high school, later studying at American University and earning his master's at Northwestern University. Scully worked for a while at WSEE-TV in Erie covering politics and government as a reporter besides a couple of other local news jobs, before landing with C-Span. He's been with the non-profit company for 19 years. Last year, Scully gave a speech about how divisive and partisan today's political climate in Washington D.C. is. "Politicians need to start talking with each other," he says, "not at each other." He lists a number of issues in the past — notably civil rights — in which Congressional Democrats and Republicans worked together. "Where we are as a country," he says, "where we need to go, this partisanship is only bringing us down. We have so many major issues, we need to come together as a country." This year, Scully was instrumental in getting the big-name Global Summit speakers Karl Rove and David Brooks, with both of whom he has good working relationships. He tells a story of begging Rove for a five-minute interview back in 1999, which turned into an hour-and-a-half discussion on politics, philosophy, and history, and cemented a friendship that's lasted ever since. According to Scully, getting Rove to come to Erie was easy. "He looks for people interested in politics," says Scully of Rove. "He loves to get outside the Beltway. And he loves everything about politics and history." Brooks, too, relishes speaking in Erie. "This is pretty typical of the audience he's speaking to," adds Scully, referring to the columnist's tendency to advocate on behalf of ordinary Americans. Getting Brooks and Rove to come to Erie is no small coup. Brooks is one of the most important editorial voices in the nation. With his column in The New York Times and appearances on national talk shows and news programs, Brooks has almost become the voice of the center-right. Rove, if possible, is even more influential. The man who made George W. Bush president and created the strategy and tactics of the modern Republican party's resurgence and dominance, Rove will be speaking days after the presidential election on the direction of the GOP going forward — a direction he'll have no small part in setting. The thing is, these people know Erie. And they want to come here. Because Erie is the kind of community they know of as "the heartland," "middle America," or whatever code word you want to use to signify a place like Erie, a real place with real people working real jobs and, yes, with its real problems. It's not a place like Washington, D.C., where everything is spun and politicized and fantastic. Here, we worry about getting our kids to football practice and about housing prices and our schools and getting away for afternoon to drop a hook into Presque Isle Bay. It's a tight community with a bright future. And for all, it makes it a draw for Karl Rove and David Brooks and Robert Kirshner, and keeps reeling back the Casselmans and Scullys who leave, but who want to bring back something of what they've found and done out in the wide world. "For me to share my passion for politics, and to do it for my hometown?" says Scully, "I love it. I'm enormously proud of Erie. It's a great community." And the Jefferson Educational Society's Global Summit is where it all comes together. Be sure to check out Jay Stevens' s web exclusive featuring speaker biographies, event dates, speech titles, and times. Jay Stevens can be contacted at Jay@ErieReader.com. Want to comment on this story? Click here!